Al-kisah, continue from my previous #cuticutiMalaysia with le Family at Langkawi. This is the last day we at Langkawi and activity for that day is more free and easy. So, my dad decided go for shopping. Well, if you at Langkawi shopping chocolate is WAJIB! Hahahahaa..
YEAYYY! I want to continue with #cuticutiMalaysia entry here. Recently I went to Langkawi as you read my previous post HERE. My second day at Langkawi is much more packed with activities. After we have our breakfast at the Hotel, we basically gather for some briefing and picture moment and then, the trip begins! 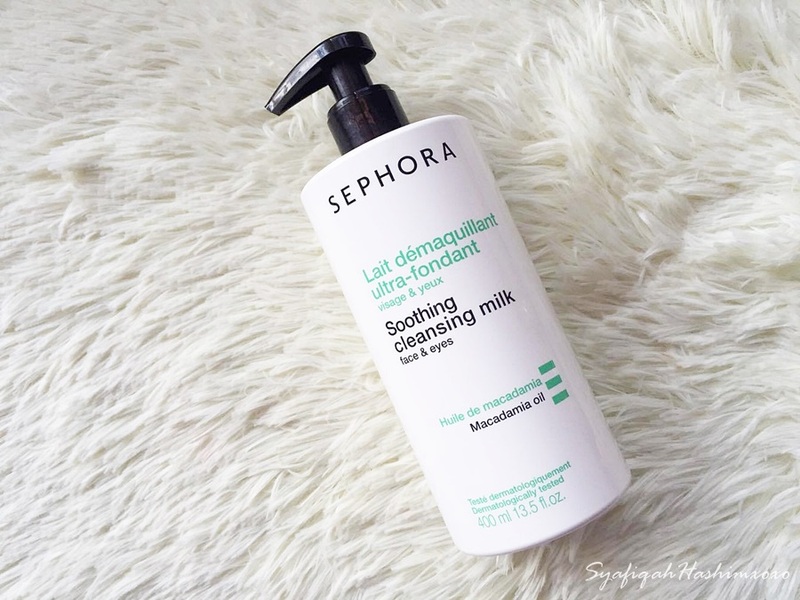 The main reason I purchase this because my previous milk cleansing from Medkare finished and I decide to find new cleansing milk and I went to Sephora and notice about this. I read through the label and I find that this is just what I'm looking for. So, Here I want to share my experience using this product. The main reason why I choose milk cleansing because I was advised by expert to ensure do double cleansing every night. Therefore I keep this as my night-time routine. This is how the packaging looks like. You can see I make a haul about this product HERE. This product come in two sizes if I'm not mistaken which in 200ml and 400ml. The one I own is in 400ml which can last up to 6 month I guess based on how regular you use it. Last Monday I went to Setia City Mall to spend some quality time with my BFF. He come all the way from Melaka just to celebrate my birthday. How SWEET! We spend some quality time together go for lunch and watch movie The Huntsman: Winter's War. The movie quite good! I like it and heard so many good review about this movie as well. Worth to watch! ehehee.. Since he told me the very last minutes I don't really prepare on what to wear that day, I just open my wardrobe and find anything that seem casual and not to much. This is more like my Casual look. I know it is really hard to find my look wearing pants because I prefer skirt. I have a great weekend even I have to rush from one place to another but I'm HAPPY! Thank you Allah for all the beautiful people you put in my life. I'm so grateful for what I have today. Alhamdulillah.. I have so many things to share with you guys, wait yahh! Last time I find one beautiful quotes that make me think how lucky I am. And everyone should feel the same way! "Success is not the key of Happiness, Happiness is the key of Success!! If you love doing what you are doing, you will be SUCCESSFUL!" Have you ever think to try purple lipstick before? Yup, I did and I buy one! Hehehee.. 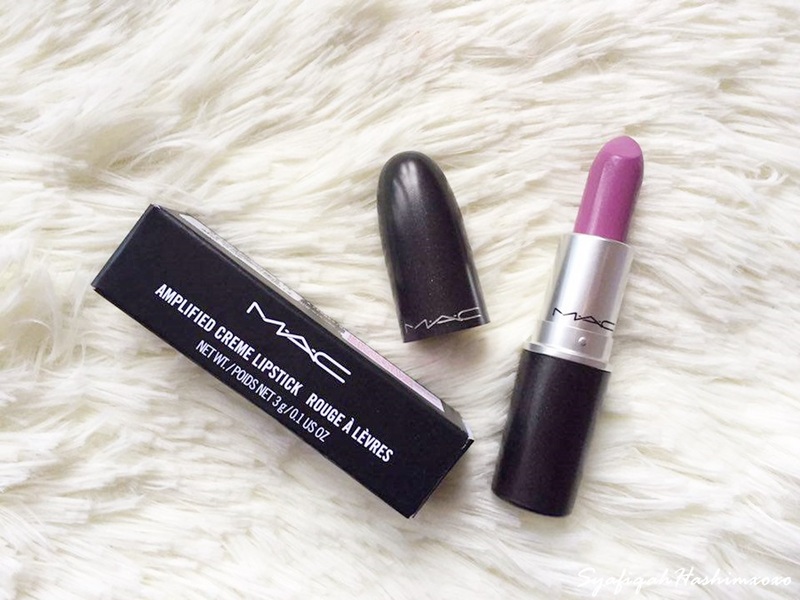 This another MAC Lipstick Review but this lipstick have quite "brave" tone to it because the color is purple! ACER now introduce the Limited Hello Kitty Edition of Revo One. OMG! This little thing is soo cute. Only available 600 units in Malaysia and i bet the number of availibility get decreasing by now. This ideal for digital entertainment and multimedia sharing with its lifelike cinematic experience of high-quality audio and video. 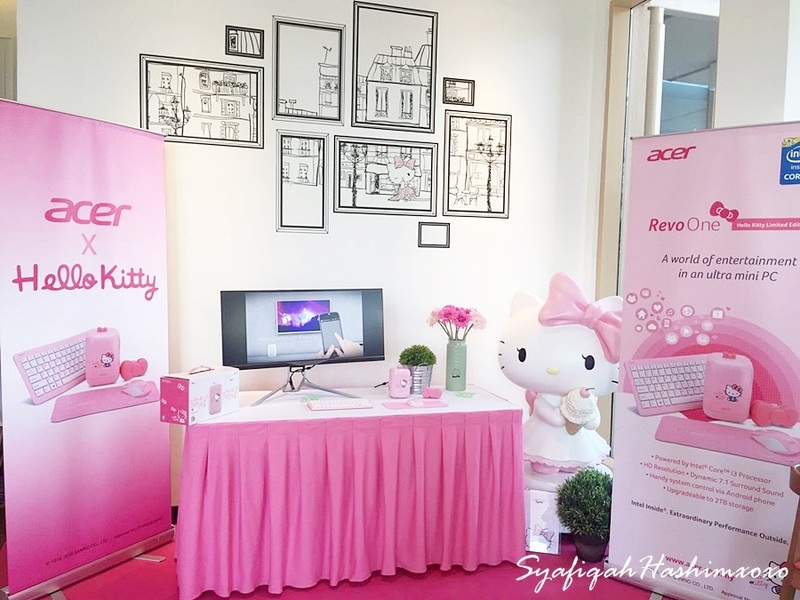 Sporting the iconic Hello Kitty on a pink background, the limited ACER Revo One Hello Kitty edition is set to capture the hearts of fans of ACER and Hello Kitty of course. It is like a world of entertaiment in an ultra mini PC! This ultra mini PC was definately cutest ever! Woahh! Yesterday was a massive day at Midvalley because Sandara Park, the member of 2NE1 are here in Malaysia. The crowd was huge! Many of K-Pop fans were there to show some love at Sandara Park. 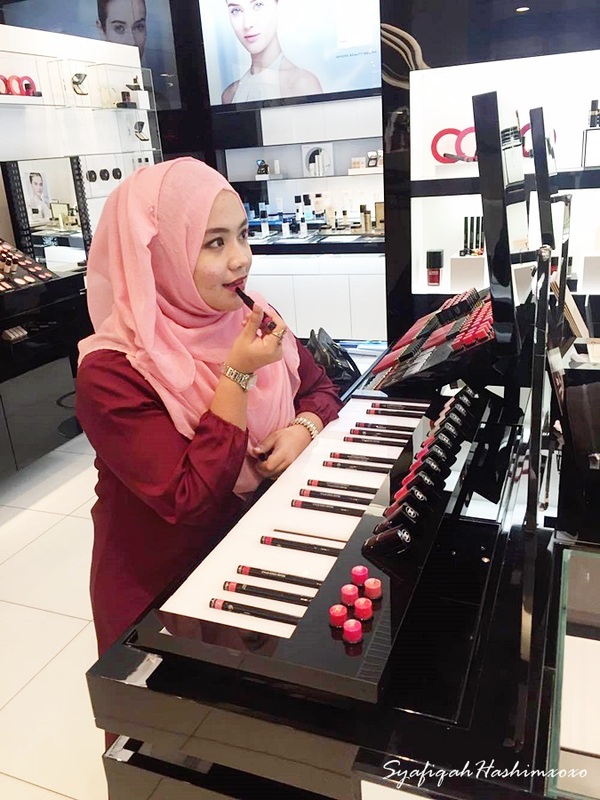 The main reason she was here yesterday at Midvalley because of the launch of Moonshot Cushion a new beauty product in market. She look stunning and adorable ever! This week has been quite different for me compare to the previous week, I finally experience Job Interview. Woahh.. It is a really good experience for me. Wish me luck guys.. Hihihiii..
That day we flying with Malindo Air, Our flight was at 2.30pm and we departure from Airport Subang. See what next to me. My seat are exactly next to this fan or blade that going to spin fast in the air. It become a little bit scary every time I try to see through window. I suppose to see a great view end up seeing this spinning blade grrr... *scary weyh! Being a plussize girl is not an obstacle for me to get dress and be more bergaya rather than I don't have a confident in going that. I just want to inform others that just because I'm a plussize that does not mean I cannot wear any nice dress that I purchase myself with my own money. Sometime, I meet such narrow mind person who only think only people in size 2-4 UK are able to wear beautiful dress. I'm so upset everytime people judge or to choose their friend based on the people looks and how the size they are. Some just choose their friend based on their popularity.. BLERGHH! *poor you! Eyeliner is a must for every girl out there. 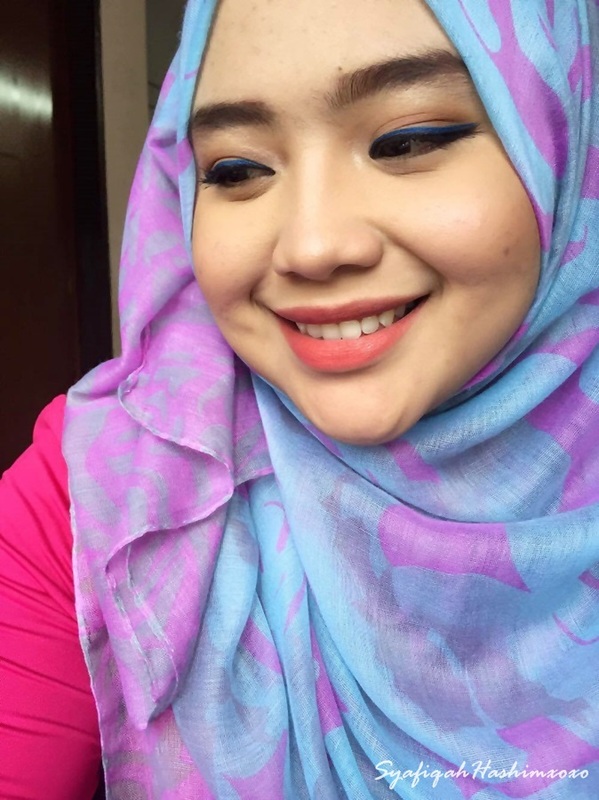 Either you a newbies in makeup world or beauty junkie eyeliner is a must, Choosing a great eyeliner sometime can be tough especially when it come to pick the great formula that suits you. If you read my monthly favorite haul for March, you surely notice that I mention about this eyeliner right. 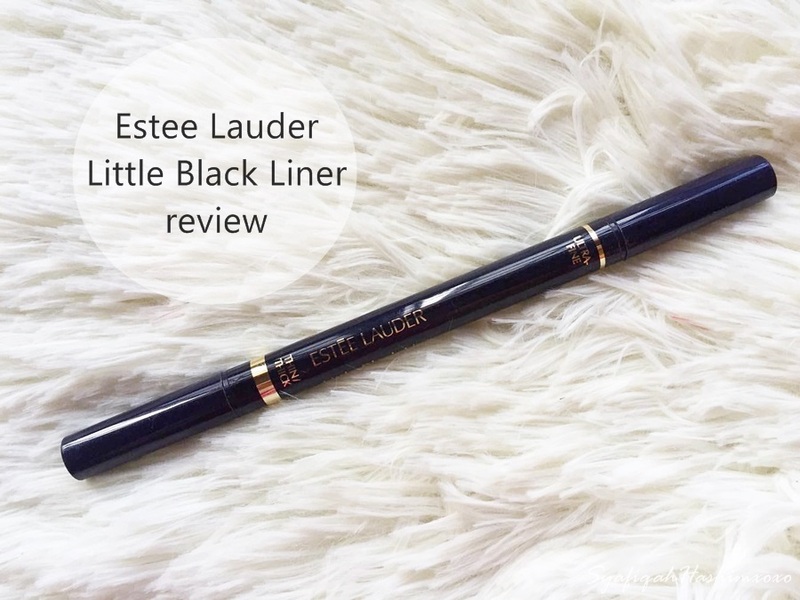 As I promise in that post I will make a full review about this Estee Lauder Little Black Liner and why I love it. 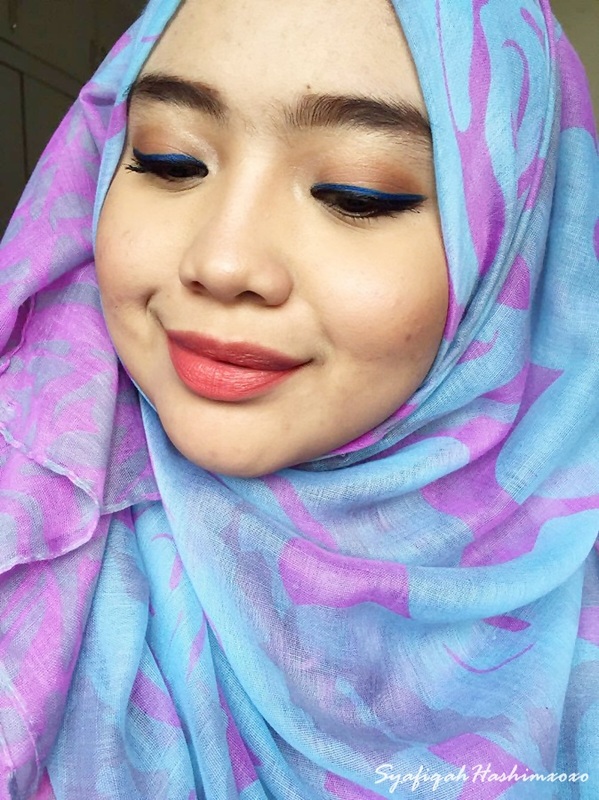 I called this makeup look "The Blue Tick" because you can see that I'm using the blue eyeliner as my main line there. This time I'm using a different kinda of eyeliner with color in it. Normally I will only used the black and brown eyeliner this time I pop-out the line with Electric Cobalt color. OMG! I really love this and I will create more makeup look like this after this. 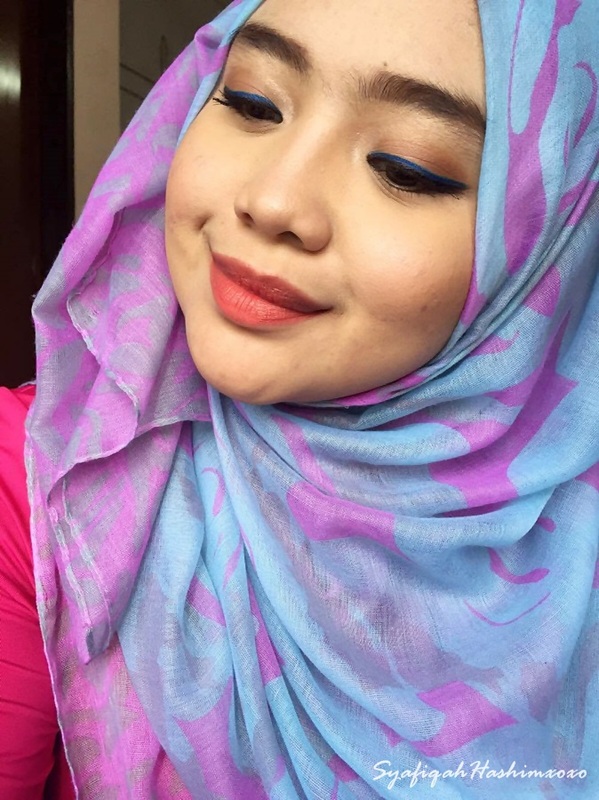 The reason why I'm choosing this because I own the Estee Lauder Double Wear Stay-in-Place Eye Pencil in 09 Electric Cobalt color and I want to use the eye pencil therefore this makeup look was created! Wallahhh~ What do you think of this look? I will make a full review about the eye pencil soon. Wait yahhh..
Can you see the 3 successful person here. On 31 March 2016, I was invite to attend this event that was held at PWTC. This is actually an exclusive evening with D'Haja. 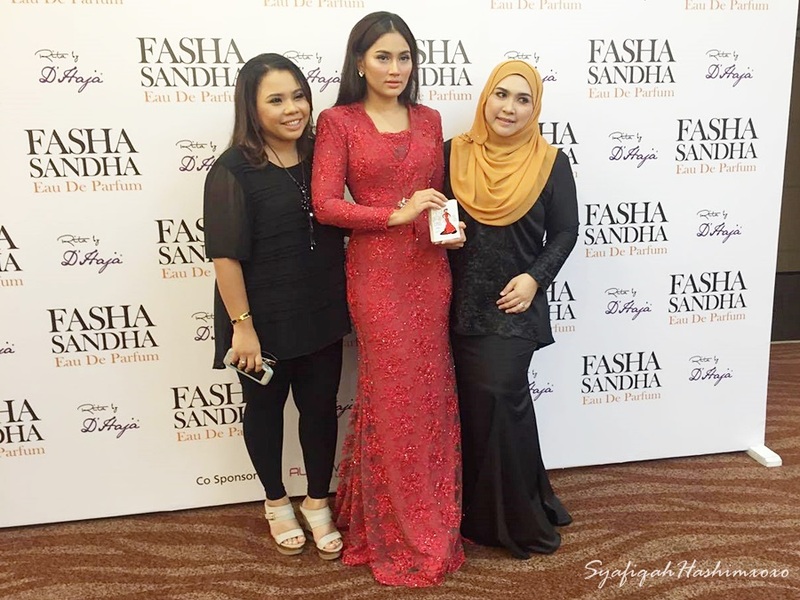 Basically that day they want to introduce D'Haja new product in market that is Fasha Sanda Perfume and RTW RITA. 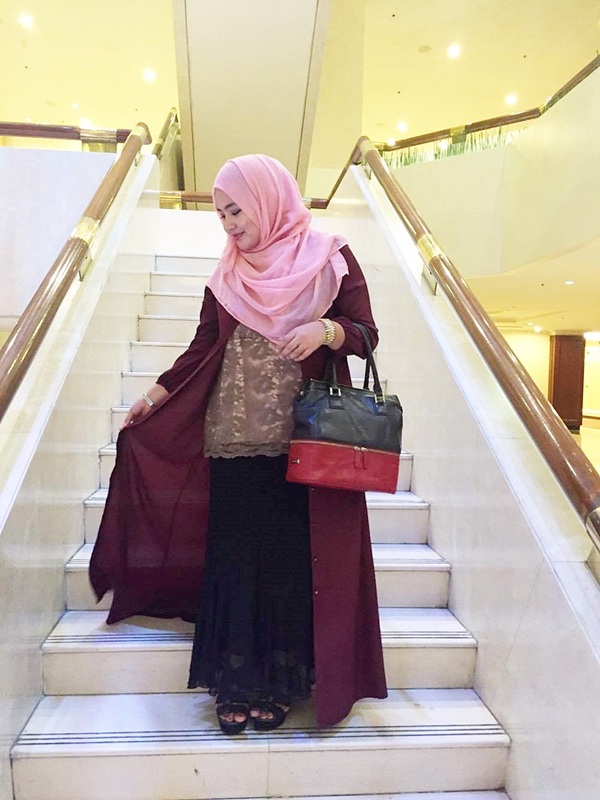 This collaboration is quite good and interesting because this is also involving an adorable Malaysia celebrity Fasha Sanda and a successful entrepreneur, Rita Dato' Sosilawati. All this thanks to the founder of D'haja, Puan Ija Ahmad. Just nak keep in-track with you guys that right now I'm on diet back. Hahaha.. Back in-track to shape up my body. Jyeahhh.. After learning some lesson from those who experince their lose weight process I feel the same way. I take it as slow & easy movement. I don't want to put much pressure to my body because it will make my body feels tired and I will get bored with it. Hahaha.. Overall, this is not in the main topic here. Hahahaa.. 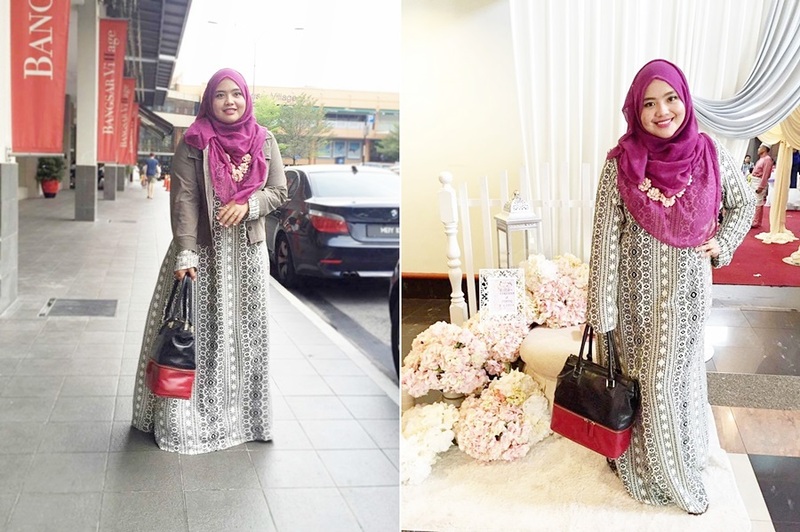 I want to share about my outfit that I wore during a Fashion Show by D'Haja last few weeks. Well, you can tell that I have nothing new to share, I just recycle outfit that available in my closet yet I change the idea on style it. 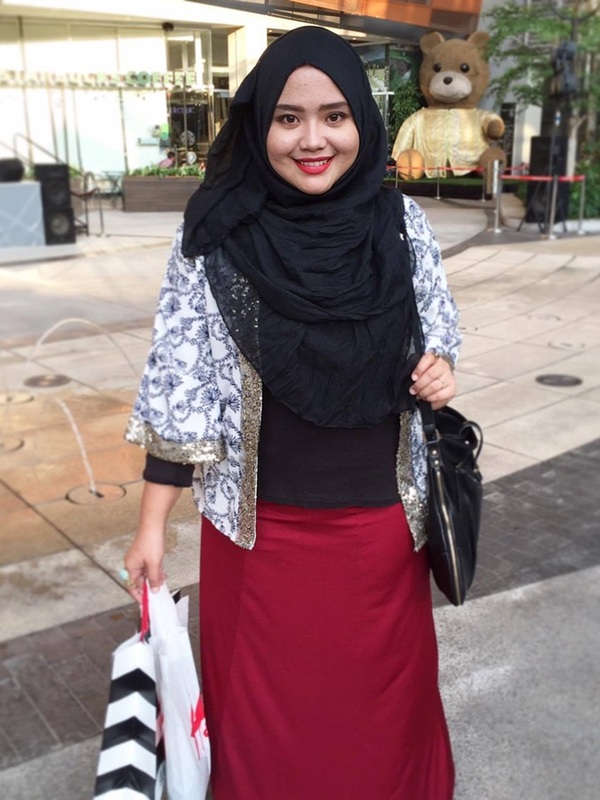 This time I used my long cardigan from Poplook and pair it with my lace blouse and black skirt. The overall look here is the long cardigan obviously. If anyone wondering why you couldn't find this on Poplook website it is because I bought this like 3 years ago babes. Hahahaa.. It is actually a button long dress but unfortunately for me, I cannot button it. LOL! That is why this beautiful dress becoming my long cardigan. Hehehee.. I will update about the D'Haja Fashion Show later on. First, check out my outfit yahh..
Can you see how RED my lips there??? JYEAHHHH! If you happen to read this 2 blogpost that I recently post HERE and HERE. You surely know that I have 2 different event with different concept in one day. So, I decide to style out something that able to fit the look with two different concept. So I would like to share this tips to you girls out there. I guess it is been a week since they are officially Husband and Wife. 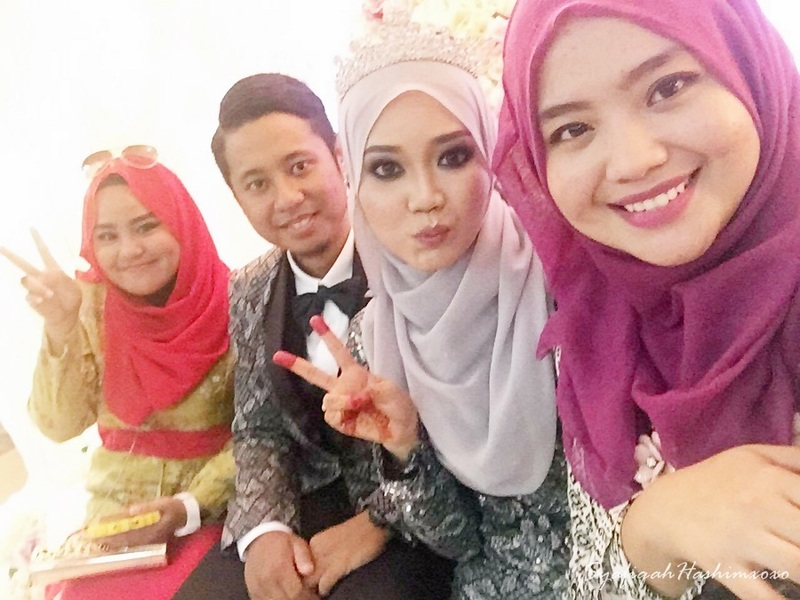 Congratulation Fana & Syafiq for your wedding. 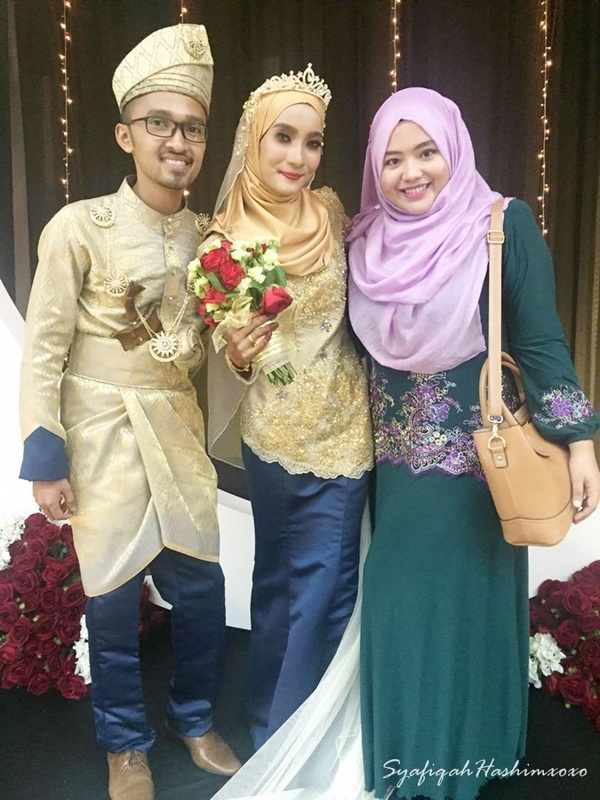 Last Saturday on 2nd April 2016 I attend my friend wedding at Bangsar. I feel happy for both of you. I wish the best for your future, Be happy as always taw. Semoga berbahagia hingga ke anak cucu and murah rezeki kehendak-Nya! Amiin.. Thanks for the invitation and so on. It feel so great that I'm able to know you as my friend. Starting from "dunia blogging" and now we're friend in real life. I'm really happy be friend with you, Fanaa and Syafiq of course. Anyway, you still owe me "SUSHI DATE" hehehee.. I love you lahh.. Muahh muahhh.. Excited nak rasa Brownies sedapp from Fanabakes lagi ni. Aumm! Last Saturday on 2nd April 2016, I was invited to join a Beauty Workshop by Shizens at Pavilion. 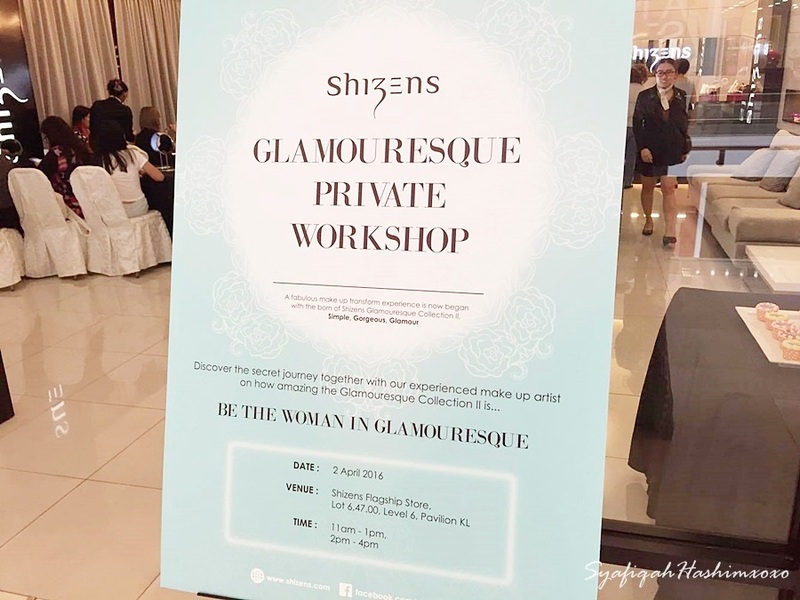 This workshop called as Shizens Glamouresque Private Workshop. Thanks to Butterfly Malaysia a.k.a Tammy for the invitation. I really happy that I'm able to join this workshop. Actually I come a little bit late due to traffic issues but anyway I'm there and I got to play along with the products by Shizens. To be honest, the reason I have faith to check out and try this product because it is based with Organic! You know lahh this day, there is soo many product that you can get on the market works effectively yet contain to many chemicals that can make your skin worst in the future. So, it is really important to ensure that you choose a good skincare. 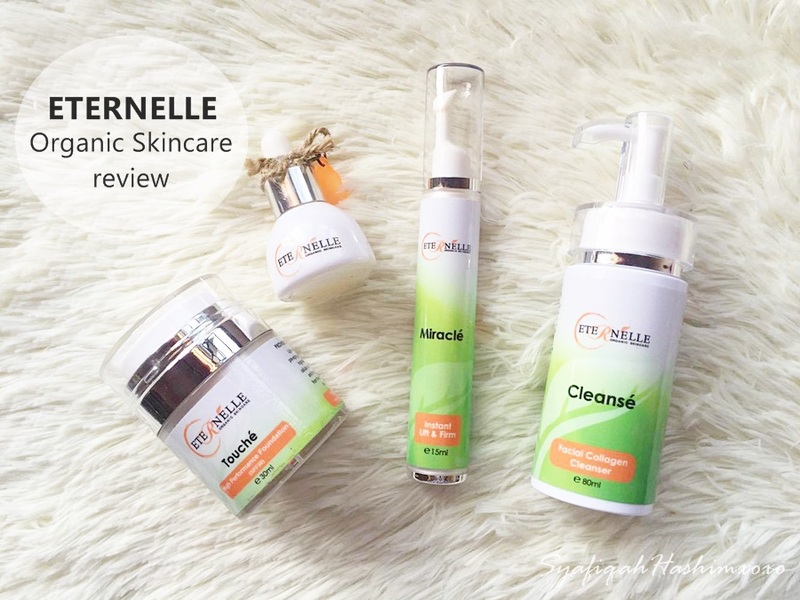 With ETERNELLE Skincare Series you don't have to doubt about it. It is inspired by the traditional Japanese use of high quality, yet effective natural botanical elements. Formulated as pure, organic and all natural to nourish your skin with maximum benefits regardless of skin type. This product definitely suitable for our humid weather in Malaysia. This will not only help revitalize your skin to regain and retain its youthful glow and also improve the health of your skin in the long run with continuous application. Just be comfortable in your own skin and stay confident! For the past month, I've lost my confident T_T. I don't know why. Tetiba je hilang. I feel sooo lazy to face with the public. I prefer to stay at home watching TV and spend my time decorating my room. I reject so many event because I don't like to be in public. I feel like my confident level is fade off. Sedihh jap bila ingat balik. Hurmm..
Its April already!! My favorite month because my birthday is around the corner but I don't like the fact that i'm getting older. Arghhh... Still can't believe that I going the reach 24 soon. 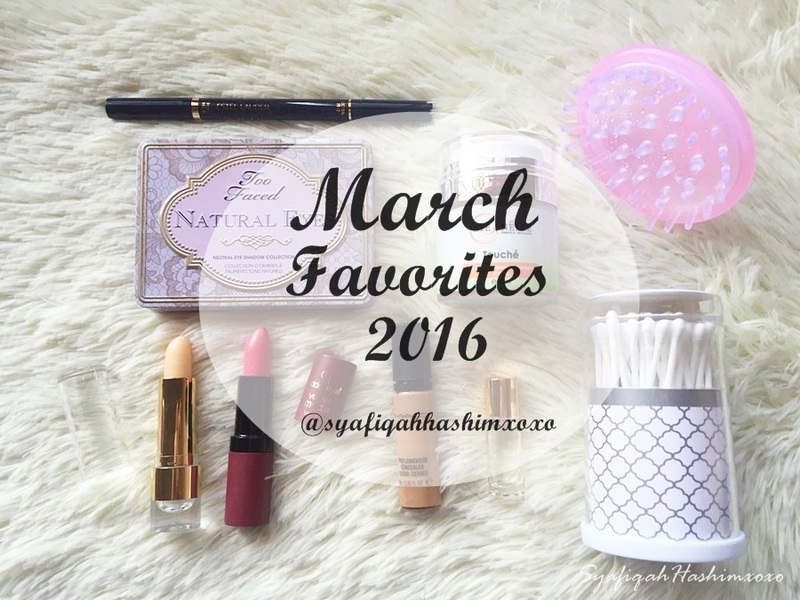 Well, age is just a number right, Ngeee.. Now it is the time for my Monthly favorites post for March. I posted this post a little bit late because I was so busy during the last moment of March. Here are the products I've use it recently. 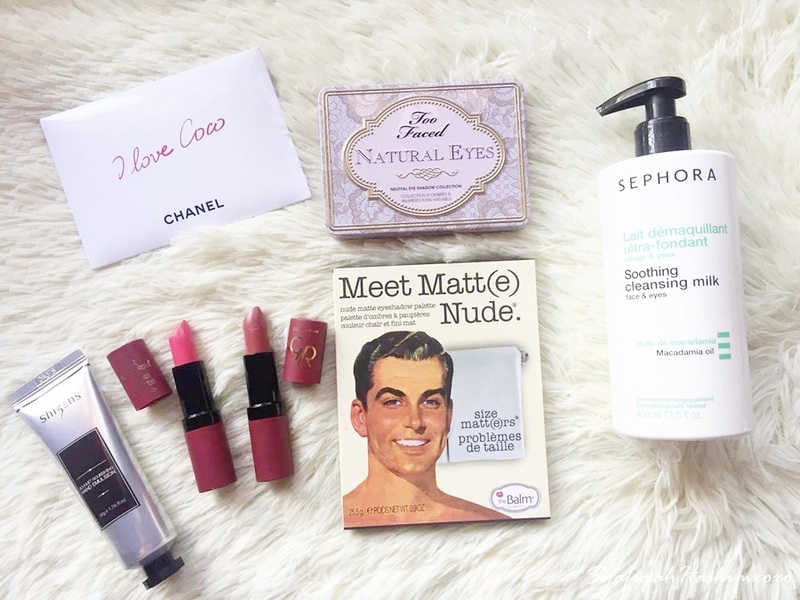 Well, sometimes I still used the same product I mention in the previous month favorites but here something that I would love to share with you guys for the month of March. 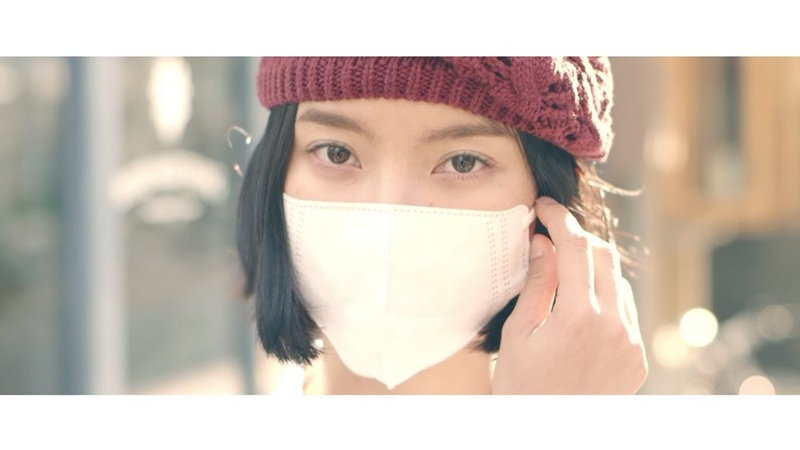 If you happen to watch this video titled LALIN you should know how I'm feel right now. DAMN!! Hahahaaa.. For those who doesn't know about this viral short film on Youtube you can watch HERE. If you try to understand the message it was DEEP! Last Sunday on (27th March 2016) I went for shopping. Wahhh.. dah lama tak shopping rasa nya!! Semanjak I dah habis my study and now officially "tanam anggur" ni. Ihiks.. It was nice shopping spree that day because my sweetheart want to buy me makeup!! YEAYYYY.. Happy sekejap.. So, what I wear that day was a very simple outfit. I dig'in my wardrobe and I found one kimono that I own for about a years and I don't have a chance to wear it yet. I find this look is really casual. 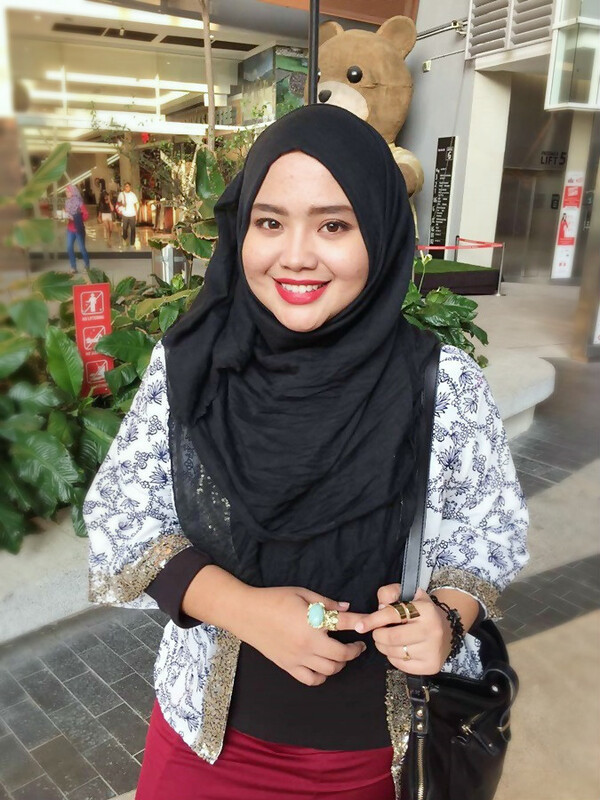 Best part is I wear black shawls with my red lipstick. AUMMM! 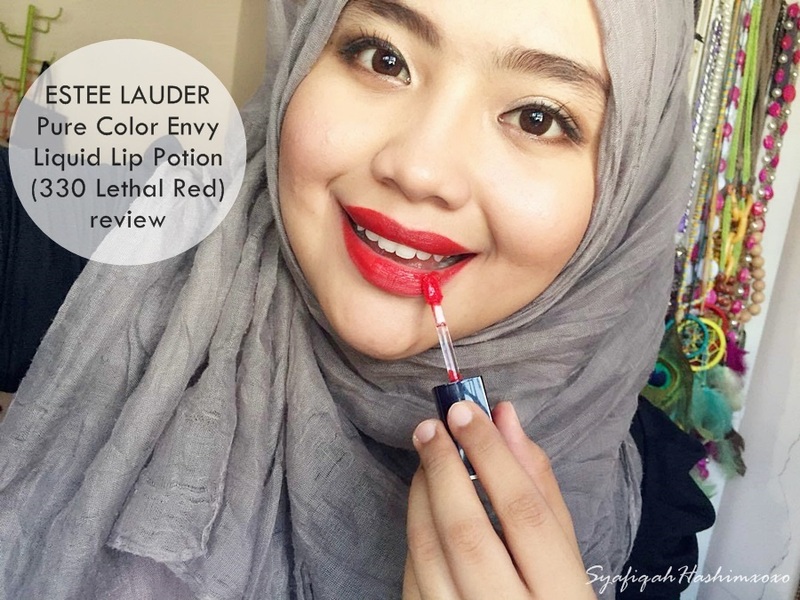 If you want to look fairer, nak nampak cerah and glowing especially in the picture, I suggest you to match Red lipstick with Black/Dark Scarf color because this will create an illusion of "glowing" look and of course, lighting also important lahh.. You try it and then let me know if this experiment works. Hehehee.. I feel soooo ANGRY right now and I want to share this with you so you don't face the same thing as I do! Penat-penat pun gigihkan jugak nak share sebab tengah geram to the MAXXX!!! Actually I'm from Cheras because I have casting there and after that, I'm looking some place to eat so I saw this one classy restaurant from the outside. So, I decide to stop by there and have a dinner. At the first place I don't see the signboard because the signboard is sooo dark! Since the place seem cozy, we decide to go in. The moment I saw the menu, OMG! It is sooo expensive. Everything expensive. So, I put a very high expectation to it. The food must be good but DAMN!!! I was wrong. It taste sooo NOT GOOD. TASTELESS.. 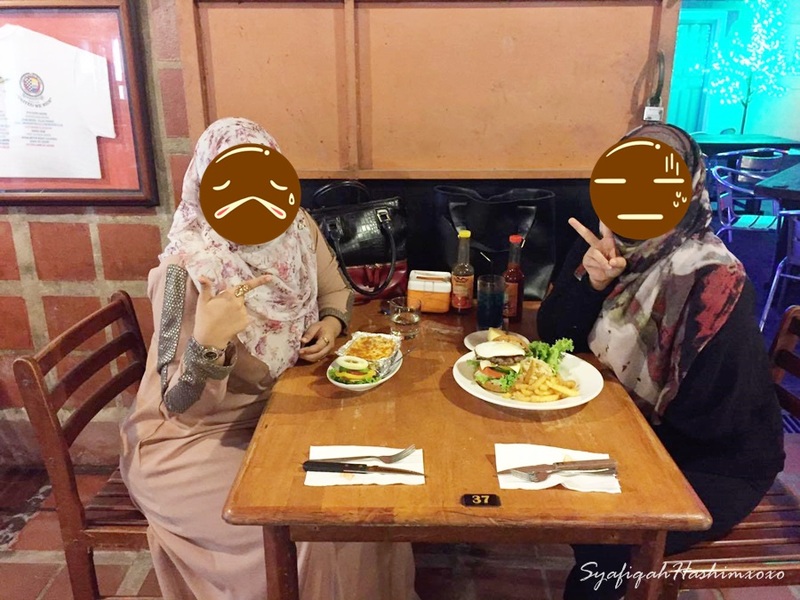 Since in the picture we smile so bright but I edit the real feeling of us eating here. BAD BAD BAD. ZERO STAR for you this Milwaukee Steak Corner, Cheras. Tengok title pun mesti korang tahu, I'm Starstruck! Finally I meet Yunaliszarai weyhhh..